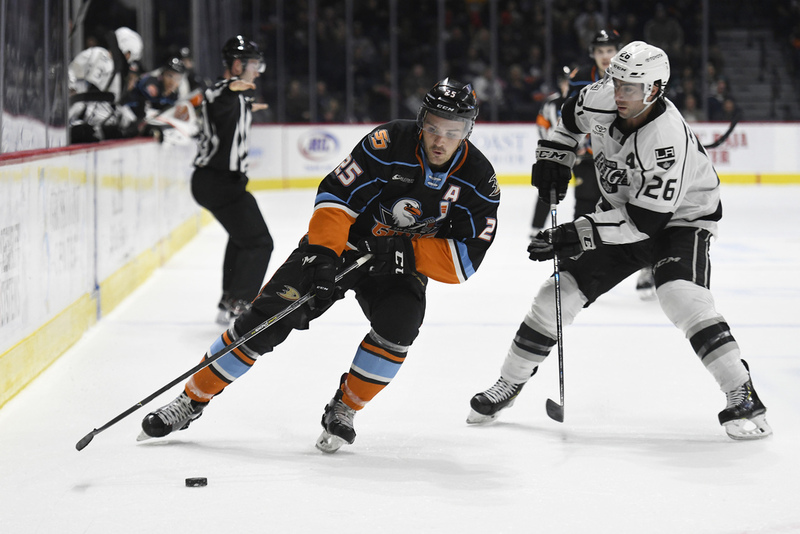 Sam Carrick’s record-setting 22nd goal of the season was the highlight for the San Diego Gulls in a 6-3 loss to the Ontario Reign on Wednesday evening at Pechanga Arena San Diego. Carrick took a pass from Matt Berry and put a shot from the bottom of the left wing faceoff circle over Ontario goaltender Cal Petersen’s right shoulder 12 minutes 54 seconds into the first period to set the single-season goal-scoring record for the Gulls four seasons in the American Hockey League. “Sam came out of training camp highly motivated and he’s been excellent on a nightly basis,” Gulls coach Dallas Eakins said. “He’s a real good leader for us. He lives his life right away from the rink. The goal gave the Gulls (24-14-2-3) their lone lead. The Reign scored the next four goals for a 5-2 lead. Carrick broke the record set by Corey Tropp in the 2016-17 season, tied by Antoine Laganiere later that season as Tropp failed to score a goal in his final nine regular-season games that season, and tied by Kalle Kossila last season. “It would feel a lot better if we won the game,” said Carrick, whose 22 goals are the most for a player in the Pacific Division, whose seven teams play fewer games than teams in the AHL’s other three divisions. Carl Grundstrom had two goals and an assist for Ontario (14-22-4-2), last in the Pacific Division. The Reign tied the score 27 seconds after Carrick’s goal as left wing Jamie Devane deflected defenseman Alex Lintuniemi’s shot from the point for his first goal in his 15 games with Ontario. Matt Moulson gave the Reign the lead for good 19 seconds later on his team-leading 19th goal off assists by Grundstrom and Philippe Maillet. Ontario center Kyle Bauman scored the second period’s only goal, redirecting Matt Roy’s slap shot from the point 15:35 into the period for his fourth goal in 41 games this season with the Reign. Ontario increased its lead to 5-2 5:03 into the third period on Grundstrom’s backhanded shot over Gulls goaltender Kevin Boyle’s glove for his second goal of the game. Kalle Kossila scored for the Gulls 29 seconds later on a two-on-one rush with Troy Terry, whose 24th assist gave him a share of the AHL’s rookie scoring lead with 40 points. Matt Roy scored an empty-net goal of the Reign with 31 seconds left. Grundstrom opened the scoring on a breakaway 10:14 into the first period off a pass from Maillet, his first goal in his three games with Ontario. Grundstrom was acquired Jan. 28 by the Reign’s NHL parent team, the Los Angeles Kings, in a trade with the Toronto Maple Leafs. Grundstrom had 13 goals in 45 games with Toronto’s AHL affiliate, the Toronto Marlies. Kiefer Sherwood scored the Gulls first goal on a shot from the right faceoff circle 11:29 into the first period. The goal was Sherwood’s first goal in his eight games with the Gulls this season. The Gulls led 40-25 in shots, including an 18-10 advantage in the first period and 11-4 edge in the third, in front of a crowd announced at 6,847. Boyle (19-7-1-0) made 24 saves. Petersen (5-11-2-1) made 37. The Gulls were scoreless in their four power-play opportunities. The Reign was scoreless in their three. Defenseman Trevor Murphy fought for the first time in his 16 games with the Gulls, brawling with Ontario left wing Sam Herr 12:46 into the second period. Both players received five-minute majors for the fight. Murphy was called for a two-minute minor tripping penalty before the fight which was served by Berry. The Gulls, the Anaheim Ducks AHL affiliate, will begin a six-game road trip Friday at Ontario.